2Department of Marketing, Nnamdi Azikiwe University, Awka, Nigeria. 3Department of Marketing, Evangel University, Abakaliki, Nigeria. Received 04 April, 2017; Received in revised form 11 May, 2017; Accepted 17 May, 2017. Transportation, Shuttle services, Passenger preference. The growing demand for road transportation services and the increasingly competitive nature of the industry in Nigeria are indications that customers would favour firms that meet their expectations consistently. 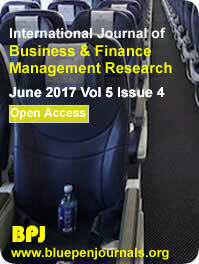 This study used the 7Ps model to assess the determinants of passengers’ preference for road transport services in Nigeria with special attention on shuttle and long distance operators. Empirical evidence from a total of 217 respondents revealed among others that product, place, people, physical evidence and process variables are significant drivers of passenger preference for road transport operators, while price and promotion variables are weak drivers. This study provides insight into the key service factors that drive road transport customers’ patronage and loyalty.